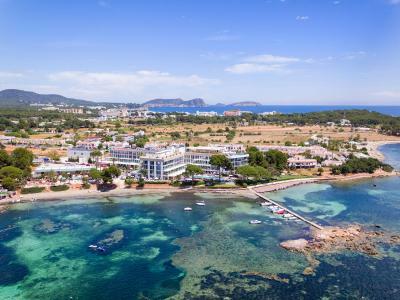 Lock in a great price for ME Ibiza – rated 8.6 by recent guests! The views are spectacular, the property is small and intimate. Rooms relatively comfortable. No problem finding chairs around the pool. Staff was attentive, and friendly. Overall I would call this a romantic property and a decent value over all. Been to 48 countries and numerous hotels, and this was my absolute favorite one. Extremely nice and luxurious venue. Breathtaking sunsets and sunrises, beautiful and relatively secluded beach. 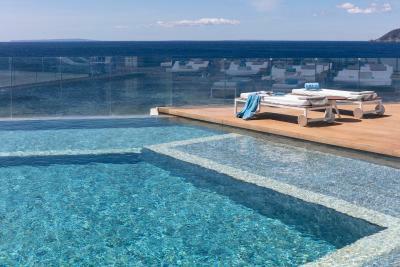 One of the best Hotels in Ibiza - Rooftop Pool with Restaurant, very friendly and attractive staff, next to the Nikki Beach Club (enjoy the famous Sunday brunch there!). We will definitely come back again! Great set up with the flow from reception through to the pool and views of the sea. Great pool, great service, very friendly and helpful staff. The music around the pool is quite loud, fine for me but to be considered if your room faces the pool and you prefer not to hear it when in your room. 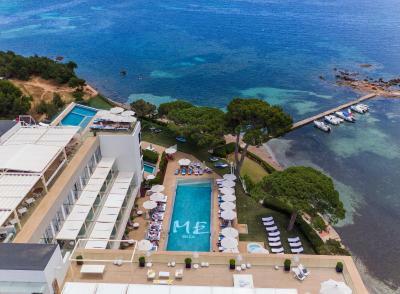 ME Ibiza This rating is a reflection of how the property compares to the industry standard when it comes to price, facilities and services available. It's based on a self-evaluation by the property. Use this rating to help choose your stay! 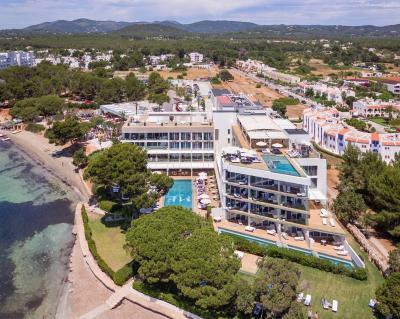 One of our top picks in Santa Eularia des Riu.Located right in front of the beach and offering multiple swimming pools, a spa with contemporary beauty treatments, and beautiful ocean views, ME Ibiza hotel is located in S'Argamassa. Free Wi-Fi is available. 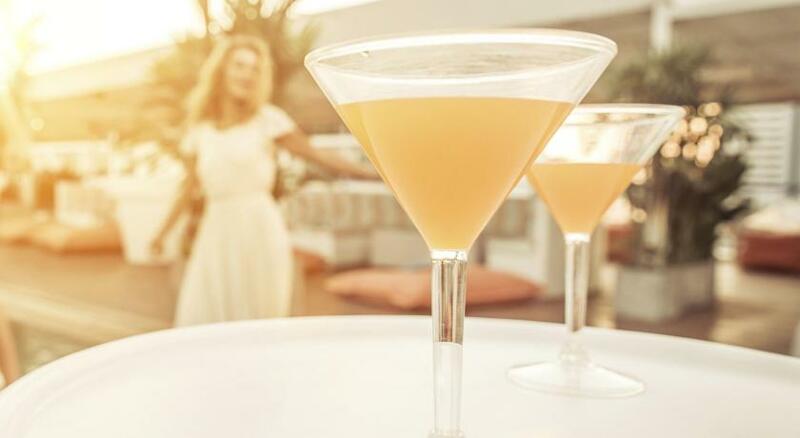 Radio rooftop bar offers Mediterranean cuisine and cocktails, with sea views. 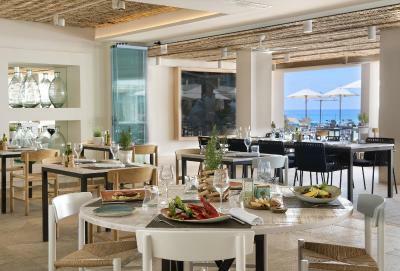 At Bianco Mare Restaurant guests can enjoy authentic Italian cuisine from organic ingredients. 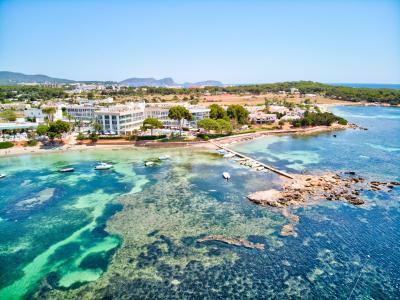 Es Cana tourist resort is just 0.9 mi away, and Ibiza town is 7.5 mi from the property. 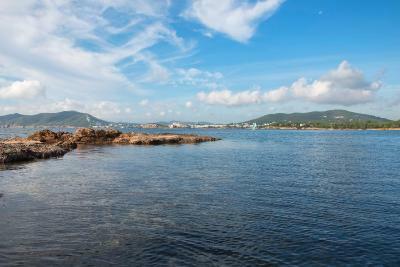 Ibiza Airport is a 35-minute drive from the hotel. You can also hire a private boat to the beautiful neighboring island of Formentera, on request and subject to availability. When would you like to stay at ME Ibiza? Featuring floor-to-ceiling windows and minimalist design, this bright and air-conditioned room has an open-plan bathroom with a rain shower. There is also a sofa and an in-room bar. These rooms are on the 1st and 2nd floors. Offering views of Nikki Beach and partial sea views, this room includes a mini-bar, personalized mood lighting and a bathroom with a rain shower. 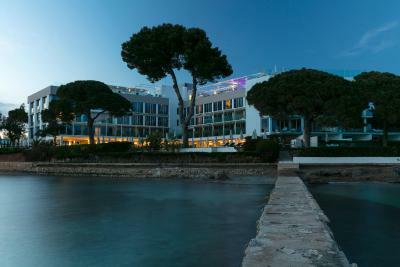 Some rooms with balcony are available upon request and subject to availability at the time of check-in. Located on the third floor, this spacious room features mood lighting and an extensive in-room bar. The bathroom features a rain shower. Offering views of Nikki beach or the Marina Bay, this suite offers a private terrace with outdoor furniture. It includes a minibar, personalized mood lighting, and a bathroom with a rain shower and Apivita amenities. Offering wonderful views of the Marina Bay, this suite includes a spacious living area, private terrace with outdoor furniture, and in-room bar experience. The bathroom has a bathtub overlooking the bay, a rain shower, and Apivita amenities. Some rooms features views of the sea and the pool. They feature personalized mood lighting and a bathroom with a rain shower and Apivita amenities. This suite features air conditioning, mini-bar and iPod dock. This quadruple room has a balcony, iPod dock and electric kettle. This suite features a balcony, sofa and iPod dock. House Rules ME Ibiza takes special requests – add in the next step! ME Ibiza accepts these cards and reserves the right to temporarily hold an amount prior to arrival. Please note that the main pool and the rooftop pool are for adults only and has an extra cost. There is a children's pool in the Kids' club. Please note that the property offers a complimentary bottle of water in all rooms. Please note that there is a surcharge per pet. Pets under 6 kg receive a special kit. Very pricey. Keep in mind that NOT everything shown on the website is included in the room price! In fact, the most appealing amenities require significant extra charges - despite the very high room rate to begin with. Most annoying in my opinion is the restricted access to the rooftop pool and jaccuzi. No drinks (including water) are included in your dinner's halfboard rate. 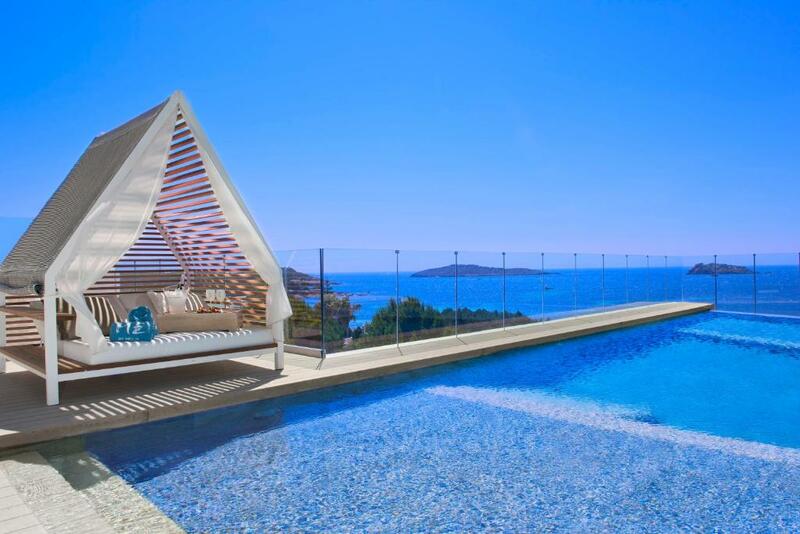 Double pool beds on the sunny side of the pool require extra charges, so does any beds on the rooftop. The gym is small, basic and not adequate for an hotel of this class. The pool can be a bit cold and the water are not heated, the ground jaccuzi isn't heated either (they claim the engine broke). Allowed to smoke in the outside area of the restaurant where the smoke was blown to the inside. There wasn't a clear division as to where the outside/inside started/finished. It would be great to ban smoking everywhere in the hotel to be honest. It,s a adult hotel!!! There is a pool for kids behind the hotel .But that,s not nice. You dont want to sit there. All excellent but if you’re a coffee lover then that’s the wrong choice. You’ll get coffees in the morning from a very old Nespresso machine, no foam, no fancy cappuccino etc. I know it’s a small detail but it would have been perfect otherwise. Room was great. Overall met my expectations. People running this hotel base their daily business on fraud and extortion. In addition to our rate on booking.com (they said it was too discounted) they made us pay 875 eur (originally asked for 1000 eur) for 5 nights in order to give us a room with a functional AC. The AC in the mentioned room could not be switched off at all (with remote controls, with a switch on an electric board in the wall, also with outside doors fully open, nor after the attempt to repair it by their technicians) and the room was freezing and unsuitable for a stay. They have not given us any choice but to pay an amount they asked to be moved to another, in their words the only available room. After the whole day lost at the reception we felt extorted and humiliated. Junior staff seems fair and hardworking, although the main aspects of this hotel do not equal a 5 star - restaurants, rooms, pool area, beach with a wall of seaweed no one bothers to clean… But it all becomes insignificant in comparison to the senior staff attitude, and the way they operate in order just to get more money, no matter if legal or not.